We chose cloth for many reasons. One, we preferred natural, breathable fibers against our baby's skin. (We used disposables with Hunter for the first ten days and would find those absorbent beads had leaked out and were on his skin a couple of times. Ick!) Two, we wanted to avoid diaper rash. (As an infant, when we did use disposables -- even Honest brand -- he would get a rash easily.) Three, we liked the eco-friendly factor. 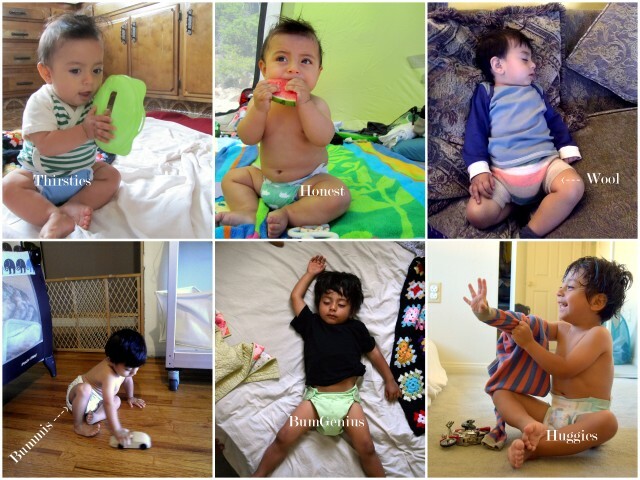 The idea of 3,000+ diapers sitting in a landfill because of my child did not sit well with me. Finally, we thought it would be less expensive to cloth diaper. Let's see if that last reason paid off, shall we? I used this website to help me calculate, based off of Hunter's birth weight, how many diapers I would have used in the first year. I also estimated 5 diapers/day for ages 12 months to 18 months. That's 3,367 diapers! I calculated cost using the the Target price for Pampers newborn diapers, Costco Huggies brand of diapers (sizes 1-3), and Costco Huggies brand of disposable wipes (2 wipes per dipe), plus I factored in about one month's worth of diapers given as baby shower gifts. Using cloth, our family experienced NO savings (or very minimal savings) for the first 18 months. After that point and if we were to use all this cloth with our next child, we would start seeing some significant savings. For example, reusing cloth for 18 months with baby #2 would only cost $250 for back-up sposies, water, energy, and soap compared to $896 for disposable diapers and wipes -- a savings of $646. Some families have to move to a situation where washing cloth at home is no longer an option, so the cloth diapering stops earlier than anticipated. In our situation, I had planned to use cloth until potty training age, but due to a career change for me, Hunter and I both started school full-time when he was around 20 months. I didn't want his teachers to deal with cloth, and I didn't want to worry about my wash routine while studying, so our cloth diapering came to an abrupt stop. Families with 2 or more children using the same stash will definitely see savings in the long run. I've heard some people say that their child started using the potty at a very young age (before 2) because of cloth, but there are plenty of families who still use cloth past 3 years old, so it depends a lot on each child. Hunter started really using the potty at 2.5. Had we continued to use cloth for another year, we would have seen some savings even with just one child using cloth. Since I chose to use sized prefolds and fitted diapers, even if we had continued to use cloth with Hunter until he learned to use the potty, we would still have had the upfront expense of buying the next size up. What if we had used other cloth diaper systems? To conclude, cloth diapers can definitely be a cheaper solution if you're very careful and deliberate about what you buy. You can even make diapers out of old t-shirts! Plus, the savings continue the longer your child is in diapers and if you use them with subsequent children. On the other hand, cloth diapers can also be more expensive than disposables. My vice was the wool soakers. Those are the most expensive type of waterproof cover, and buying cute styles can be addictive. Other moms like collecting special edition AIO diapers from brands like BumGenius and Flip, which can quickly add up. Although now that we are doing a cloth diaper service with Baby #2 and we aren't really saving any money compared to the cost of disposables (it's actually more expensive), at least I already have a bunch of the covers and other accessories. The only extras I bought were 2 more newborn diaper covers. *Everything else marked with an asterisk in this post, I will be able to use alongside the diaper service. I think it also matters what age your child potty trains at. Obviously you can't go into your cloth diapering journey knowing that, but my oldest didn't potty train until he was 3 (and then it took a bit longer for nighttime) and my second looks like she'll have similar timing. So in the case of your example, where it sounds like you only accounted for sposies up until 18 months, that would be the break even point and then the next 18 months we'd come out ahead with cloth ;) I'm also more of an elitist with disposable diapers than I am with cloth (when we need sposies we always use Pampers, which are the most expensive, I think) so cloth comes to the rescue in that case as well! But it's obviously going to vary a lot between families for all of those reasons! Great point about the potty training age -- I will change my post to be more specific about that! I tried to make that clear in my post that for our family we only broke even at the 18-month mark and that if we had gone longer (and were going to use this same stash for baby #2) we would start to see some savings. I don't regret doing cloth at all, it's just that I totally assumed that I had saved hundreds of dollars until I actually did the math ;) Like you said, there are so many variables to factor in when figuring if cloth is the less expensive route!